Marguerite L. Barrett, M.S., Mark W. Smith, Ph.D., Anne Elixhauser, Ph.D., Leah S. Honigman, M.D., M.P.H., and Jesse M. Pines, M.D. As health care costs rise, there is increased emphasis on cost-effective care. Hospital stays that involve time in an intensive care unit (ICU) are of particular interest because critical care costs have been rising for decades, reaching 13.4 percent of hospital costs by 2005.1 From 2002 through 2009, ICU stays rose at three times the rate of general hospital stays without an increase in severity of illness.2 The reason for higher utilization of ICUs is unclear. Because ICU stays represent a costly segment of health care spending, it is important to understand patterns and variation in ICU utilization. This Healthcare Cost and Utilization Project (HCUP) Statistical Brief presents data on ICU utilization by adults in U.S. general medical and surgical hospitals in 2011. For this brief, ICU utilization includes various types of intensive care such as medical, surgical, coronary, pulmonary, psychiatric, burn, and trauma. Hospital stays and aggregate hospital charges are presented for discharges with and without an ICU stay. Conditions and procedures with high and low utilization of ICU services are reported with the percentage of total hospital charges for ICU services. In addition, ICU utilization is compared for conditions and procedures with and without complications or comorbidities. Finally, the types of hospitals with high and low ICU utilization are presented. This Statistical Brief used the HCUP State Inpatient Databases (SID) in 2011 for 29 States that included revenue center codes identifying ICU and coronary care unit (CCU) care. The analysis considered 16.9 million inpatient stays from 1,882 hospitals. To our knowledge, this is the first study of all-cause ICU utilization in a broad cross-section of U.S. hospitals. In 2011, 26.9 percent of hospital stays in 29 States involved intensive care unit (ICU) charges, accounting for 47.5 percent of aggregate total hospital charges. Common conditions and procedures with high ICU utilization varied across body systems. The highest rate of ICU use (93.3 percent) was for respiratory disease with ventilator support. Cardiac conditions accounted for 8 of the 18 conditions and procedures with high ICU utilization. ICU utilization for cardiac conditions ranged from 40.6 percent for stays for chest pain to 70.3 percent for stays for acute myocardial infarction with major complications or comorbidities. Hospital stays that involved ICU services were 2.5 times more costly than other hospital stays. ICU services were on average three times more likely when patients experienced major complications or comorbidities. Greater utilization of ICUs tended to occur in hospitals that were large, private/for profit, located in metropolitan areas, trained medical students, and had a high-level trauma center. Figure 1. Adult hospital stays and aggregate total hospital charges by intensive care unit (ICU) use in 29 States, 2011. 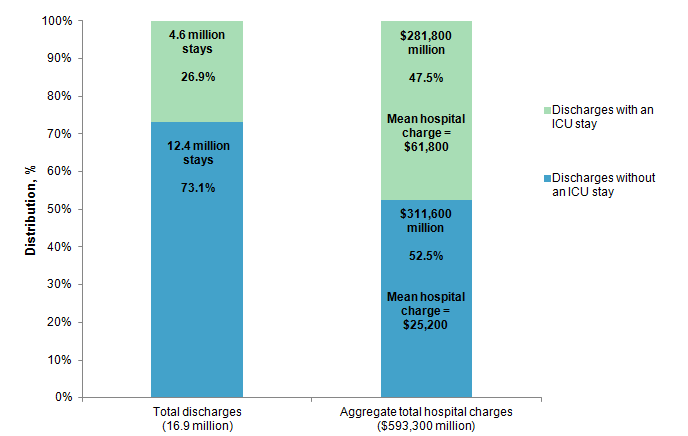 Figure 1 is a bar chart that shows the proportion of discharges with and without an ICU stay and the proportion of aggregate total hospital charges associated with discharges with and without an ICU stay in 2011. Of 16.9 total discharges in 2011, 4.6 million (26.9%) included an ICU stay and 12.4 million (73.1%) did not include an ICU stay. Of the $593,300,000 in aggregate total hospital charges in 2011, $281,800,000 (47.5%) were for discharges that included an ICU stay and $311,600,000 (52.5%) were for discharges that did not include an ICU stay. The mean hospital charge for discharges with an ICU stay was $61,800, and the mean hospital charge for discharges without an ICU stay was $25,200. Hospital stays that involved ICU services were two and a half times more costly than other hospital stays. Hospital stays with ICU services accounted for just over one-quarter of all discharges (26.9 percent) but nearly one-half of aggregate total hospital charges (47.5 percent). The mean hospital charge was 2.5 times higher for discharges with ICU services than for those without—$61,800 versus $25,200. 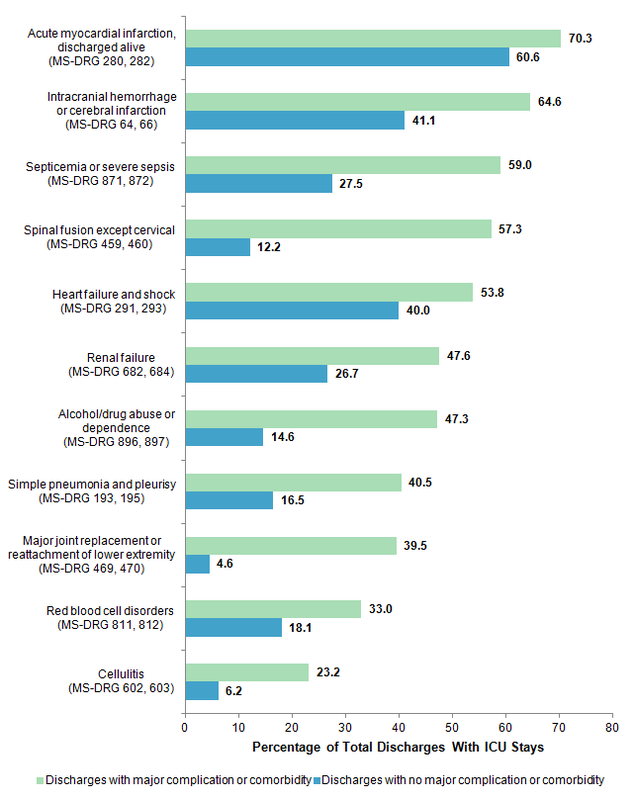 Table 1 presents 18 common conditions and procedures that involved high ICU utilization in 2011, sorted by descending percentage of total stays with ICU services. Medicare Severity-Diagnosis Related Groups (MS-DRGs) are used to identify conditions and procedures for hospital billing. MS-DRGs reflect the presence of complications or comorbidities. MS-DRGs selected for Table 1 had a high percentage of stays with ICU utilization (at least 40 percent of stays had ICU services) and at least 40,000 stays with ICU utilization. * Percentage of total charges attributed to ICU is defined as follows. Within an MS-DRG, we first determined the average total charge for stays with ICU services. Next, for the stays with ICU services, we determined the average charge for the ICU services. If a hospital stay had charges to different types of ICUs, the individual charges were included in the total ICU charge for the stay. The percentage of total charges attributed to ICU is the average charge for ICU services divided by the average total charge for discharges with ICU services. Cardiac, respiratory, and neurologic conditions dominated stays with high ICU utilization. Cardiac conditions accounted for 8 of the 18 conditions and procedures with high ICU utilization. ICU use ranged from 40.6 percent of chest pain stays to 70.3 percent of stays for acute myocardial infarction with major complication or comorbidity. Stays for chest pain—a common symptom of acute myocardial infarction but for cases in which no critical illness is found during the hospital stay—had a high use of ICU services, presumably for telemetry monitoring and further diagnostic testing. Thus patients who do not receive a definitive diagnosis of a life-threatening cardiac condition are sometimes billed for ICU-level services. Respiratory conditions were at the top and the bottom of the list of high ICU utilization. Stays for respiratory disease with ventilator support less than 96 hours had the highest ICU utilization (93.3 percent), and stays for simple pneumonia with major complication or comorbidity had the lowest ICU utilization (40.5 percent). ICU utilization for intracranial hemorrhage or cerebral infarction varied depending on the presence of complications or comorbidities. Utilization ranged from 64.6 percent of stays with major complications or comorbidities to 46.7 percent of stays when complications or comorbidities were not major. For conditions with high ICU utilization, ICU charges represented between 10 and 38 percent of total hospital charges for stays with ICU services. Charges for ICU services ranged from a high of 38.2 percent of total hospital charges for heart failure and shock with complication or comorbidity to a low of 10.3 percent of total hospital charges for percutaneous cardiovascular procedure stays with drug-eluting stent without major complication or comorbidity. This analysis was limited to those stays with ICU services. For the majority of conditions and procedures with high ICU utilization in Table 1, more than one-quarter of total hospital charges (25-38 percent) were attributable to ICU services when the stay involved ICU care. Table 2 presents 15 common conditions and procedures that involved low ICU utilization in 2011, sorted by descending percentage of total stays with ICU services. MS-DRGs selected for Table 2 had a low percentage of stays with ICU utilization (fewer than 20 percent of stays had ICU services) and at least 100,000 total stays. Although for Table 1 we used the criterion of 40,000 hospital stays with ICU services, when looking at conditions with low ICU utilization we had to limit the criteria to 100,000 stays, regardless of ICU services, to display a similar number of MS-DRGs. * Percentage of total charges attributed to ICU is defined as follows. Within an MS-DRG, we first determined the average total charge for stays with ICU services. Next, for the stays with ICU services in the MS-DRG, we determined the average charge for those ICU services. If a hospital stay had charges to different types of ICUs, the individual charges were included in the total ICU charge. The percentage of total charges attributed to ICU is the average charge for ICU services divided by the average total charge for discharges with ICU services. Birth-related stays tended to have the lowest rates of ICU utilization. Five of the 15 common conditions with low ICU utilization involved childbirth. About 8 percent of stays for other antepartum diagnoses with medical complications involved ICU services. Less than 1 percent of stays for vaginal deliveries without complicating diagnoses involved ICU services, and the percentage of ICU utilization increased to 2.4 percent with complicating diagnoses. Two mental health and substance abuse conditions appeared on the list of stays with low ICU use. Nearly 15 percent of hospital stays for alcohol and substance abuse without complication or comorbidity involved an ICU stay, and 4.3 percent of stays for psychosis had ICU charges. Two common operations had low ICU utilization. Twelve percent of spinal fusion except cervical without major complication or comorbidity involved an ICU stay, and nearly 5 percent of stays for major joint replacement or reattachment of lower extremity without major complication or comorbidity had ICU charges. ICU charges represented 7-55 percent of total hospital charges for stays with ICU services for conditions and procedures with low ICU utilization. Charges for ICU services ranged from a high of 54.5 percent of total hospital charges for hospitalizations for psychoses that involved ICU services to only 6.6 percent of total hospital charges for stays with a spinal fusion procedure that had ICU services. For the majority of conditions and procedures with low ICU utilization, more than one-quarter of total hospital charges (26-55 percent) were for ICU services when the stay involved ICU care. Figure 2 shows selected conditions and procedures from Tables 1 and 2 with a related MS-DRG that varied by the presence or absence of complications or comorbidities. Conditions from Table 1 with major complications or comorbidities are displayed next to the same condition with no complication or comorbidity. Similarly, conditions from Table 2 with no complication or comorbidity are displayed next to the same condition with major complications or comorbidities. Figure 2. Intensive care unit (ICU) utilization for related conditions and procedures in the presence or absence of complications or comorbidities in 29 States, 2011. Figure 2 is a bar chart that shows the percentage of total discharges with ICU stays in 2011 with major complication or comorbidity and with no complication or comorbidity for 11 related conditions and procedures. For discharges with ICU for acute myocardial infarction, discharged alive (MS-DRG 280, 282), 70.3% involved major complication or comorbidity and 60.6% involved no complication or comorbidity. For discharges with ICU for intracranial hemorrhage or cerebral infarction (MS-DRG 64, 66), 64.6% involved major complication or comorbidity and 41.1% involved no complication or comorbidity. For discharges with ICU for septicemia or severe sepsis (MS-DRG 871, 872), 59.0% involved major complication or comorbidity and 27.5% involved no complication or comorbidity. For discharges with ICU for spinal fusion except cervical (MS-DRG 459, 460), 57.3% involved major complication or comorbidity and 12.2% involved no complication or comorbidity. For discharges with ICU for heart failure and shock (MS-DRG 291, 293), 53.8% involved major complication or comorbidity and 40.0% involved no complication or comorbidity. For discharges with ICU for renal failure (MS-DRG 682, 684), 47.6% involved major complication or comorbidity and 26.7% involved no complication or comorbidity. For discharges with ICU for alcohol/drug abuse or dependence (MS-DRG 896, 897), 47.3% involved major complication or comorbidity and 14.6% involved no complication or comorbidity. For discharges with ICU for simple pneumonia and pleurisy (MS-DRG 193, 195), 40.5% involved major complication or comorbidity and 16.5% involved no complication or comorbidity. For discharges with ICU for major joint replacement or reattachment of lower extremity (MS-DRG 469, 470), 39.5% involved major complication or comorbidity and 4.6% involved no complication or comorbidity. For discharges with ICU for red blood cell disorders (MS-DRG 811, 812), 33.0% involved major complication or comorbidity and 18.1% involved no complication or comorbidity. For discharges with ICU for cellulitis (MS-DRG 602, 603), 23.2% involved major complication or comorbidity and 6.2% involved no complication or comorbidity. The presence of a major complication or comorbidity was associated with greater use of ICU services. On average, ICU use was three times more likely with the presence of major complications or comorbidities for these conditions. This ranged from a negligible increase for acute myocardial infarction with major complication or comorbidity (16 percent increase) to nearly nine times higher (a 900 percent increase) for major joint replacement with major complication or comorbidity. Even for more severe conditions such as stroke (intracranial hemorrhage or cerebral infarction), septicemia, and renal failure, the difference in rate of ICU utilization was 57-115 percent higher when a major complication or comorbidity was present. Table 3 presents the characteristics of hospitals that have low, medium, and high ICU utilization. Hospitals are grouped into three categories on the basis of percentage of all stays with ICU services. In the bottom quartile of hospitals—those with the lowest rates of ICU stays—less than 12.8 percent of stays included ICU services. In the top quartile of hospitals—those with the highest rates of ICU stays— more than 34.8 percent of stays had ICU services. The two middle quartiles were combined into one reporting group. Note: n represents the number of hospitals that fit the category in the row and had the percentage range of ICU cases in the column. * Values are at least 10.0% higher than the row percentage for all hospitals within the group of hospitals (i.e., at least 10% higher than 25.0% for hospitals in the bottom quartile, at least 10% higher than 50.1% for hospitals in the middle two quartiles, and at least 10% higher than 25.0% for hospitals in the top quartile). ICU utilization varied by key hospital characteristics. Higher ICU utilization was common in large hospitals, hospitals located in large metropolitan areas, private/for-profit hospitals, teaching hospitals, and Level I or II trauma centers. Lower ICU utilization was common in small hospitals, hospitals located in rural areas (not metropolitan or micropolitan), publicly owned hospitals, hospitals with critical access designation, and nontrauma centers. Many of these characteristics overlap; for example, many critical access hospitals are in rural areas, rural hospitals are usually small, and most small hospitals have nontrauma center status. The estimates in this Statistical Brief are based upon data from the Healthcare Cost and Utilization Project (HCUP) 2011 State Inpatient Databases (SID). A total of 29 States had the necessary data elements for identifying intensive care unit (ICU) use (Uniform Billing revenue center codes) and reported associated revenue center charges. MS-DRGs constitute a patient classification system that categorizes patients into groups that are clinically coherent and homogeneous with respect to resource use. MS-DRGs group patients according to diagnosis, type of treatment (procedures), age, and other relevant criteria. MS-DRGs are sensitive to whether the stay involved complications or comorbidities. Each hospital stay has one assigned MS-DRG, which may be medical or surgical. Revenue centers are administrative units found in hospital accounting systems. They roughly correspond to types of care provided. When hospitals submit bills to insurance companies, revenue centers in which care occurred are represented by codes. The codes are four-digit numbers in the Uniform Billing system used by hospitals in the United States. For this study, stays with ICU services were identified by the presence of any of the Uniform Billing revenue center codes defined in Table 4. Both a conceptual understanding of these different types of critical care units and results of empirical analyses suggest that they should be combined into a single ICU category. Cardiac care units (CCUs) are similar to ICUs but specialize in treating patients with heart disease. Cardiac hospitalizations were often coded as having ICU services, and noncardiac hospitalizations were reported as having CCU services. Accordingly, this Statistical Brief includes CCUs in the ICU category. Similarly, the definition of ICU in this Statistical Brief considers intermediate-care ICUs and CCUs as regular ICUs because not all hospitals distinguish between intermediate and other forms of intensive care. If the hospital had any of the above services, then it was considered to have evidence of an ICU. About 76 percent of the hospitals reported to AHA that they provide ICU services, 14 percent reported no ICU services, and 10 percent were missing AHA data. In the 29 sample States, 1,882 hospitals (85 percent) reported ICU services to the AHA and provided revenue codes and charges in the SID. Together these hospitals reported a total of 16.9 million adult inpatient stays in the SID. This analysis used State Inpatient Databases (SID) limited to data from community hospitals, which are defined as short-term, non-Federal, general, and other hospitals, excluding hospital units of other institutions (e.g., prisons). Community hospitals include obstetrics and gynecology, otolaryngology, orthopedic, cancer, pediatric, public, and academic medical hospitals. This analysis was further limited to general medical/surgical hospitals. This excluded specialty hospitals and long-term care facilities such as rehabilitation, psychiatric, and alcoholism and chemical dependency hospitals. However, if a patient received long-term care, rehabilitation, or treatment for psychiatric or chemical dependency conditions in a general medical/surgical hospital, the discharge record for that stay was included in the analysis. Hospital charges reflect the amount the hospital billed for the entire hospital stay and do not include professional (physician) fees. Charges usually exceed what the hospital receives in payment for its services. ICU charges are calculated by summing the charges reported across all ICU revenue centers. For the purposes of this Statistical Brief, charges are reported to the nearest hundred. We chose to report charges because the HCUP cost-to-charge ratio is a hospital-wide adjustment that does not account for differences across charge centers. The cost-to-charge ratio for the ICU would certainly be different than for other charge centers, and applying a hospital-wide ratio would not reflect those differences. The following hospital characteristics were obtained from the American Hospital Association (AHA) Annual Survey of Hospitals: bed size, ownership, and status as a teaching or critical access hospital. The actual bed size for the hospital was categorized as small, medium, or large on the basis of differences across census region, urban location, and teaching status. The categorization of small, medium, and large is consistent with the grouping used for the HCUP National (Nationwide) Inpatient Sample (NIS). A teaching hospital is defined as having a residency program approved by the American Medical Association, being a member of the Council of Teaching Hospitals, or having a ratio of full-time equivalent interns and residents to beds of 0.25 or higher. This definition is also consistent with the NIS. Hospital location is determined by the 2003 version of the Urban Influence Codes (UIC) designation for the county of the hospital. Large metropolitan areas are metropolitan areas with at least 1 million residents; small metropolitan areas are metropolitan areas of less than 1 million residents. More precise definitions of these categories, and the complex definitions of micropolitan and rural areas, can be found on the Web site of the Economic Research Service, U.S. Department of Agriculture (currently http://www.ers.usda.gov/data-products/urban-influence-codes.aspx). Trauma designation for trauma centers treating adults and children were identified through the Trauma Information Exchange Program (TIEP) database, a national inventory of trauma centers in the United States. Agency for Healthcare Research and Quality. Overview of the State Inpatient Databases (SID). Healthcare Cost and Utilization Project (HCUP). Rockville, MD: Agency for Healthcare Research and Quality. Updated September 2014. http://www.hcup-us.ahrq.gov/sidoverview.jsp. Accessed September 11, 2014. Barrett ML (M.L. Barrett, Inc.), Smith MW (Truven Health Analytics), Elixhauser A (AHRQ), Honigman LS (George Washington University, Washington DC Veterans Affairs Medical Center), Pines JM (George Washington University). Utilization of Intensive Care Services, 2011. HCUP Statistical Brief #185. December 2014. Agency for Healthcare Research and Quality, Rockville, MD. http://www.hcup-us.ahrq.gov/reports/statbriefs/sb185-Hospital-Intensive-Care-Units-2011.pdf. 1 Halpern NA. Can the costs of critical care be controlled? Current Opinions in Critical Care. 2009 Dec;15(6):591-6. 2 Mullins PM, Goyal M, Pines JM. National growth in intensive care unit admissions from emergency departments in the United States from 2002 to 2009. Academic Emergency Medicine. 2013 May;20(5):479-86. 3 More information on the HCUP cost-to-charge ratios is available on the HCUP User Support Web site at http://www.hcup-us.ahrq.gov/db/state/costtocharge.jsp. Accessed November 19, 2014. 4 The HCUP Methods Series Report #2011-04 discusses different approaches to refining the hospital-wide cost-to-charge ratios. This report is available on the HCUP User Support Web site at http://www.hcup-us.ahrq.gov/reports/methods/methods.jsp. Accessed November 19, 2014. Internet Citation: Statistical Brief #185. Healthcare Cost and Utilization Project (HCUP). November 2014. Agency for Healthcare Research and Quality, Rockville, MD. www.hcup-us.ahrq.gov/reports/statbriefs/sb185-Hospital-Intensive-Care-Units-2011.jsp.